Each unit is a deeded timeshare ownership. Ownership usage can be split into 2 separate stays, totaling 7 Nights. This timeshare can be deposited with RCI and I.I. This is a "week", of trading power on RCI not points. RCI has classified their weeks into trading power. 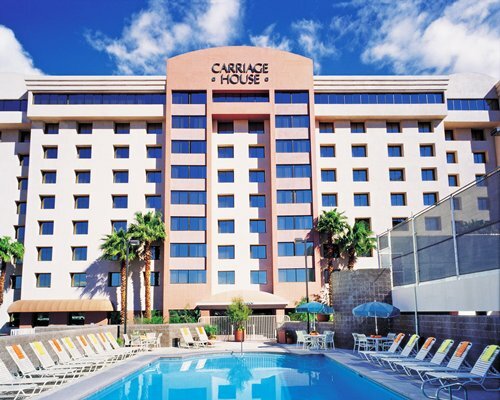 An amenity-packed hotel suite in Vegas is not easy to come by just one block from the Strip, but at The Carriage House, there are plenty of lodging options sure to please couples, families, or individual travelers. The Studio layouts, including a Las Vegas suite with one king bed and a floor plan that features two double beds. Each of the deluxe guestroom varieties covers 340 square feet, and each comes with a small table with two chairs to facilitate easy business travel or just to provide additional seating. Silver - Non-Holiday Weeks. current blackout weeks include: New Year's Day, President's Day, Easter, Memorial Day, 4th of July, Labor Day, Thanksgiving, Christmas. Rollaway beds are not available in all room types. * Animals are not permitted on the property except for service animals. How do I make a reservation or request that my week be banked with an exchange company? You can call, mail, fax or email your request. Our website includes an online reservation request form which can be completed and sent to the property. You will receive an email response within 24 hours, confirming or denying your request. How do I bank my week with RCI or Interval International? Simply call The Carriage House Reservations Department @ 800.221.2301 ext. 280 and request your current week be deposited with your exchange company. Or you may complete the online reservation request form. You will receive an email response within 24 hours. Please provide your CHTA account number and RCI or II account number and allow up to 72 hours for the transfer to occur. What are the phone numbers and website addresses for RCI and Interval International? 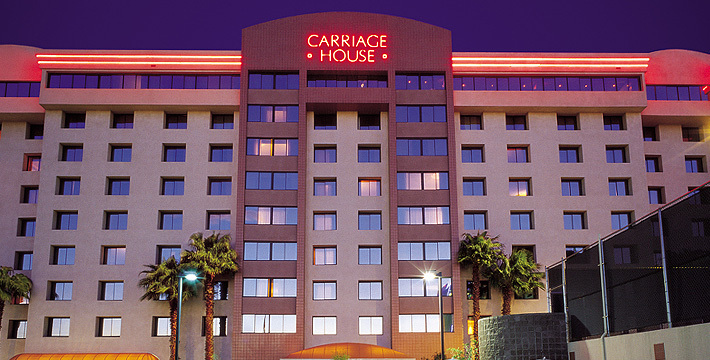 If you have any questions, please contact The Carriage House @ 800.221.2301 ext 280 or by email at info@carriagehouselasvegas.com for specific procedures on working with OTHER exchange companies as they are different from RCI & II procedures. Will the CHTA rent my week for me?No, the CHTA does not have an owner rental program. However, you can rent your week on your own. Once you have found someone interested in renting your week, contact the reservations department for availability. Please have alternate dates available in the event your first choice cannot be confirmed. The reservation will be mailed in the guest's name and the confirmation will be sent directly to you. Please advise your guest that a valid credit card is required upon check-in for deposit and incidental charges purposes. No personal checks or cash are accepted. I would like to give my week, as a gift. How do I do this? Call, mail, fax or email your reservation request, giving the CHTA the full name of your guests. The reservation will be mailed in the guest's name and the confirmation will be sent directly to you. Please advise your guest that a valid credit card is required upon check-in for deposit and incidental charges. No personal checks or cash are accepted. Does the CHTA have bonus time? Owners are offered discounts from 10%-50% based on availability. Please call the reservations department for the rates and availability. Rental reservations are normally only offered 30 days prior to the arrival date. This insures that all owners have priority to use their vacation time. When does my current week expire? You have through August of the following year to use your week at the CHTA. Bronze owners have only until May 31 of the following year to use their week within their season. Bronze owners can book June through August, 30 days or less prior to arrival, and will be subject to nightly season upgrade charges of $20-40 plus 12% tax. However, if you want to bank with your exchange company, you must do so during the current year. December. Bronze Season is available April and May. Carryover time cannot be split. Carryover time cannot be used with an exchange company. Carryover time cannot be booked more than 90 days in advance. Please note, the longer you wait to make a reservation, the greater the chance space will not be available to accommodate your request. I made a reservation and need to cancel. Will I lose my week?As long as you cancel at least 14 days prior to arrival, your time will be reinstated. I would like to deposit next year's week into my exchange company account. May I do this? Yes, simply send in the estimated annual maintenance assessment with a letter requesting that your week for next year be deposited. The estimated annual maintenance assessment is the amount paid for the current year. For more information, please contact the Reservations Department @ 800.221.2301 ext 280. When I call Reservations for a weekend, there is little or no availability. Why is this?Weekends are very busy in Las Vegas. If you are flexible and are able to travel Sunday through Thursday, it is often easier to reserve your Carriage House week on short notice. You may also want to place your name on the waitlist. Should an owner cancel their reservation, you will be notified via email and/or telephone. May I reserve a larger unit for a specific reservation? Room upgrades may be requested 30 days or less prior to your confirmed arrival date and are confirmed on a space available basis. Please see the Reservation Policies & Procedures section for applicable nightly charges. Contact the Reservations Department directly for more information. Is there RV or Oversized vehicle parking on property? There is limited space for oversized vehicles, trailers, motorhomes and boats. Arrangements must be made, prior to your arrival, to accommodate these vehicles on property. Please contact the hotel directly for more information. Are animals allowed on property? Only service animals are allowed on property. What is the best time to call Reservations? As with most businesses, Monday is the busiest day of the week. If you call on a Monday, we apologize if you are put on hold for a short time. Better yet, please try to call on another day of the week. When requesting reservations more than 90 days prior to arrival, the request must be submitted in writing. The Reservations Department is available to assist you from 7am - 5pm daily. Limited assistance is available after hours. Please remember you can email your reservation requests and/or questions to us, and we will respond within 24 hours. Yvonne Brown, in Owner Services is available to assist you Sunday through Wednesday 7am to 2pm.